In Horizon Zero Dawn, you have some options to level up quickly. Successfully completion of main story quests and eliminating machines will yield you many experience points. But if you want to level up quickly in Horizon Zero Dawn, then you’ll probably have to look for possible tips and tricks. If you're not afraid to use your limited resources to level up quickly, then you can easily deal with monsters that leave many XP after they die. Once you have found their spawn locations, you can always go back and fight with them. The fact is that you can quickly level up but it would be much nicer if you could earn XP without spending much resources and time. We'll give you more tips. If you still want to practice in combat, then we recommend you the following two opponents. 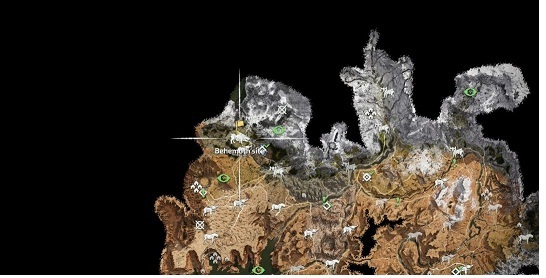 Behemoth: The following map shows you where you will find this machine. Find this location and kill the behemoth repeatedly, you will be rewarded with more than 2,500 XP each time. If it is not enough for you, then try the following. Thunderjaw: You can also find this enemy in the open areas of Horizon Zero Dawn, but if you kill it as part of the quest, you can always repeat it and get more experience. Per dead, there are more than 3,500 XP. A Hunting Ground Trial is also the answer to many XP with little time and resources. Here, you don’t have to consume any resources and invest about 40 to 50 seconds to gain 10,000 experience points and can repeat this again. From the moment you take the trial to the point where you can pick up your reward, it takes about two minutes. This means that you can earn 10,000 points every two minutes. That would be a good example if you would like to quickly level up in Horizon Zero Dawn. In the gray box you see what you have to consider so that it actually works as described.